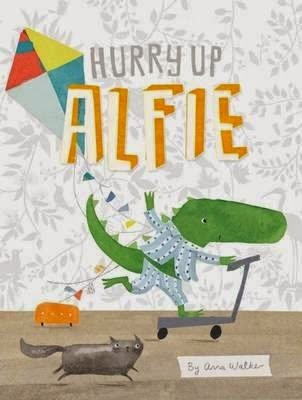 Home » Animals » Australian Author » Family » Picture Books » Reviews » Reviews by Tania » Tania McCartney » Review: Hurry Up Alfie! Alfie loves life. He's a typical kid--easily distracted--and I mean, who wouldn't be easily distracted when the world is so rich with colour and texture and movement and possibility? A busy day is ahead and Dad is trying to get Alfie out the door. First, Alfie goes missing (think doona cover). Then he needs to do some handstands on the floor. Naturally! Next, there's some serious playing and romping and imagining to be had. Of course! But can Alfie ever get dressed and get himself out the door? An absolutely gorgeous peek at a simple childhood conundrum we all know so well--both kids and adults! Anna Walker's typically gorgeous illustrations flood the page with patterned charm and movement and a colour palette to coo over. Alfie and his cat Steve McQueen are enormously enduring characters and Anna's use of multimedia is so utterly pleasing to the eye. An adorable ending reminds us that childhood is indeed a world of full expression and in-the-moment emotion that's so lacking in the adult world.